Mini eggs mini eggs mini eggs!!! Its that time of year when we start putting mini eggs on everything....well not the quiche, but defo the cakes! We have a new sign.....oooooohhhhh with new spelling......oooohhhhh..... put together by the talented Jack Simpson and Martin Lucus....thanks chaps! We love love love it!! We've finally taken the hint from you all and decided to open 7 days a week!!! AND got a card machine....I know I know...being dragged into the 21st century!! Just need the spelling to be right on the ticket! Doh! Enjoy the Easter weekend folks.....we are ready for you!! oh my word...its been far too long!!!! Well, this is a well overdue blog....what can I say...we've been busy serving all those hungry faces and bellies...oh and some of us have been growing new humans too...ME! Anyway...to the cake! Heres 3 of your favourites to get those mouths salivating....Chocolate brownie, which just so happens to be free of any gluten....a cranberry and almond flapjack....which is free of any animal products, so is vegan.....and a warm apple and cinnamon cake that is free from nothing!! Its warming up in the lakes now and is absolutely the time for salad and quiche. We change our quiche fillings pretty much every day, and the salads are always changing too. One of our favourite things to do is flick through cookbooks to get inspiration for new salads and for what is in season. This means you get to try new flavours as well as us! Theres a good salad selection on the plate below, a healthy dose of greens...gotta keep those iron levels up!! Our classic salsa, an asian style coleslaw, roasted butternut and lentil salad and a noodle salad loaded with crisp veggies.....ohhhh I could just eat it all now! Im sure you guys have noticed that we have a few new faces in the Rattle Gill?! We have Rob, Jess and John who are now serving in the cafe. Its so wonderful to have a team of people that just get what we are all about. They are all friendly, happy, creative, fun people that love serving out great food and coffee.... Jess has even won awards for Barista skills....dont mention it though, she'll get embarrassed!!!! They are never all in the cafe at the same time, so I don't have a photo of them together....but its something ill work on!! Maybe at the Staff Christmas do?? There have been many suggestions put into that box..... laser quest....paintballing.....archery.....segwaying....indoor skydiving......trampoline park??!!!! We are looking for one more member of staff for when the little McCarthy baby is here. Someone who can work part time for us, especially at the weekends. We need someone over 18 and preferably with some cafe experience. Spread the word! Well Rattlers...ill leave you with a stunning sunset shot taken by my amazing husband (4 years today I might just add!!). This was from a recent trip to visit friends in the Cotswolds....this country is truly beautiful don't you think?! Lets not leave it so long next time ey!?! The Summer holidays are here....let the onslaught of brownie eating children in!!!! Its time for some fun in the Sun!! It turns out that I haven't put the Smokey black bean recipe on here after all. Sorry to those who have asked for it and would've come on here not to find the recipe! Never fear though...today is the day for sharing! Its a 3 stage process to get the end result, but its worth it as you can always make a double batch and freeze them. Soak 750g of dried black beans overnight. Drain and rinse the beans with plenty of cold water, then put into a pan and cover with water by 2inch. Bring the mixture to the boil and then boil for 10-15 minutes. check the beans at this point. they should have a slight bite to them, if they are still too hard, boil for 5 more minutes and check again. Turn off when Beans still have a slight bite to them. Heat oven to 200. Then use a few roasting pans or a deep oven tray to put the bean mixture in. I generally use a deep pyrex dish and the heaviest cast iron pan in the world! The beans go in the oven for 40 minutes. You'll know they are done when most of the liquid has disappeared and it now looks like a thick sauce. We serve these in a few ways now....on toast, on a jacket spud and the classic way, with wraps, creme fraiche and salsa. Sometimes we even make quesadillas for our tea with them. They are pretty versatile little beans! Have a go and let me know how it goes! Enjoy getting out and about, my advice is to get on yer bike or walk as the traffic in Ambleside will get crazy from now on!! Its been a while...so heres a few new recipes to try out! Busy busy busy..... thats how its been! But not too busy for creating some new recipes for the Cafe! Thought I'd share some of the newest salads that we have tried out on the Rattle Gill Salad plate...being that its the summer season now and everyone eats salad at such times...right?! This one was inspired by the arrival of a sample pack from Suma Wholefoods. They sent us some Wild Black rice to try. YES! Its good in this salad...YUMMY! We shall call him 'Black Rice salad with Roasted butternut squash'. We literally couldn't get enough of it, and it works happily on its own or as an accompaniment to ANYTHING! 1 Butternut, peeled and cubed. bunch of flat leaf parsley, finely chopped. Heat your oven to 200C.Put the Butternut squash on a baking tray, drizzle with olive oil, scatter the Cumin seeds and season with Salt and Pepper. give it all a good mix up, so the squash is coated. Bake for 30 minutes. Take out and leave to cool. Cook the Rice according to the instructions, and be sure to cook it so it still has some bite...say NO to soggy rice! Leave to cool once cooked. Whisk the below together and then pour over the other salad ingredients. This is best left a while so that the flavours of the dressing can infuse into the rice and other goodies. If I don't have any Butternut squash, it also works well with carrots, they just need roasting longer! These 3 salads are really good friends.... A Pasta pesto with roasted Tomatoes and Spinach, A Black eyed Bean salad with a parsley vinegarette, and Our homemade Tomato Salsa. The Salsa goes with so many different dishes and is super refreshing as it has lime juice and coriander in. Finely chop everything below and then mix it all up! Mix it all up and if you like it hotter add more chilli flakes! We love having this with our Homebaked Smokey Black Beans and lots of creamy creme Fraiche! It also works well with cheddar cheese in a sandwich! We have had a mini celebration in the fact that the Road has re-opened up to Keswick! It is quite an amazing bit of engineering work that has been achieved and to drive along where 'The Gap' was, you wouldn't even know anything had ever happened! Good work team! See you all soon for Salads and then of course the obligatory slice of cake! Spring has sprung.... Our mini daffs are out! We have had a busy half term after being closed for a couple of weeks. During that time off we made a few changes... painted some walls, new artists work on the walls from dpbimages , new lights, new menu with a few changes...click here to see new menu! We've even had a few salad breakthroughs... its that time of year when there's going to be a lot more colour in our lives and on our plates! We have fully embraced this with a rainbow of new tasty salads. Below is our tangy, limey Salsa... a Pear, mint, beetroot and toasted Walnut salad... A herby Couscous with some stunning Romanesco, dill, baby courgette and parsley... and to top it off our special Noodles, dressed with Tamari, sweet chilli, sesame and crispy veggies..... ohh go on then... fill my plate up! We've even had chance to get to grips with perfecting another Gluten Free cake.... a delicious Apple and Almond cake that is just divine! And for all those Cheese Scone lovers out there, we have added those to the menu permanently!! They were getting snapped up so quickly we thought we'd better keep making them! Did I mention that we serve them warm with butter and Damson Chutney??!! Another reason I know that spring is here is I got to hold my first Lamb! Dropped in on our friends at Bank Ground Farm on Coniston Water, and one of their ewes had given birth a few days before.... CUTE or what!?? Had an awesome lunch at Broughton Village Bakery...we recommend a trip to see them if you're down that way. The rainy season seems to have ended and people are drying out. There has been amazing community spirit to support people that have been affected by the floods. If you would like to know how to help out, visit Cumbria Community Foundation for more info. Cumbria is very open, yeah there's a few things left to fix but people are still here running their businesses! Take a look at this video that was recently made to promote Ambleside and what it has to offer... made by the Team of Love Ambleside - check out their facebook page for updates on whats happening in the area. Best go practice some more art work on those lattes... i'm aiming for a unicorn riding off into the sunset next! Happy New year...lets celebrate by eating warm cheese Scones!!! The festive season is over and we have moved into another year...the year of the Monkey apparently?! Bet you all had plenty of food, good company and too much fizz?! I know we did! Its now time to sit back, relax, maybe read the paper and just chill out...on the new cushions we made... Thanks to the lovely Tom and Fer at Red Bank Roasters (our coffee supplier) we now have some cushions made of the coffee sacks that the beans get delivered in! Gotta love a bit of hessian...right?! Back to the Warm Cheese scones.... flying out the door since we got back from Christmas holidays, I literally can't make them fast enough! We are serving them warm with some good ole salty butter and the scrumptious Hawkshead Damson Chutney...a truly winning combination! When all well combined, roll mixture out to approx 4cm/1.5in and use pastry cutter to make approx 10 scones. Place on baking paper, brush with egg wash and bake in oven for 18-20 minutes…YUM! We've been asked by a few customers for our Date and Coconut slice. It is a recipe that we use that is suitable for Vegans and people with a Gluten intolerance. We were recently contacted by a journalist who regularly writes for Vegetarian times magazine and produces a guide book full of veggie cafes in the UK. He was asking about what vegan options we have...so heres one of them for you! Soak 675g dates with 200ml boiling water and 1 tsp vanilla essence. So that the water is fully absorbed. Layer oats-dates-oats and bake 25-30min/170C in 9inch square tin. You can change up the middle part of the filling and try putting some grated apple in or Prunes or a mixture of both! If you aren’t vegan or Gluten intolerant then use dairy and wheat flour! Found this stunning creature in Manchester just before Christmas...not sure who painted it, but it sure did bring a smile to our faces! Is anybody out there any wiser about the artist?! Well folks, enjoy creating what you want for 2016...and we'll be seeing you over the counter behind the ever diminishing pile of cheese scones! Advent calendars at the ready...not long now till you can open the first door!! Its been a tad wet here. Our babbling little brook outside was a raging torrent a couple of weeks ago.... check the before, during and after shot out! Its OK though, no amount of water can stop the Rattle Gill from churning out cakes and food to fill hungry folks! We've got a new special on, which has been inspired by the wonderful Gandhis flipflop curry providers! Its a mild Veggie Korma that is brimming with flavour and full of great spices...a blend and sauce made from scratch (of course!!) Its being served with a few old faithful condiments - mango chutney, lime pickle, Raita and naan breads to mop up the sauce. Its loaded with potatoes, peas, carrots and cauliflower! We've had a few outings as well over the rainy season...a wedding, an awards ceremony in Kendal (didn't win, but never mind!! ), a trip to meet the Children in Need rickshaw...(can still donate!) and a few trips into the local hills. And we've even got a new line of fizzy pop in, that does good things in the world, as well as taste great! Theres Karma Cola, Lemony Lemonade and Gingerella Ginger ale to try! The company Karma Cola is all about using fair-trade and organic products to produce a delicious drink. They also donate a percentage of their profits to the Karma Cola Foundation. Proceeds from the sale of every bottle of Karma Cola go back to the people of Boma for sustainable farming and community projects. We are really pleased to be able to support this. And check the bottles out....some customers have already taken their bottles home to use as candle stick holders!! You've gotta love a good design! Its nearly time to get that first door open on this years advent calendar....which means the count down to Christmas is beginning! We have a few parties to go to and family to visit over the festive season, so please remember to check out our opening hours, so as not to find yourself outside our closed doors tired and hungry, feeling cross at us for being closed!! This is your first official warning that we will be closed at some points!!!! Well look at that... a rainbow on the fell side! proof its not all been rain over the past month or so! Thats it for now Rattlers, see you over the festive season for a glass of hot spiced berries - non alcoholic mulled wine! And if not, have a good one!! We're Celebrating Welsh Rarebit day.....All week!!! Yes...Welsh Rarebit is celebrated on the 3rd September....so we thought we would share the love of our favourite posh cheese on toast with you all! There are loads of versions of what to put in, but we have gone for...Mature cheddar (Most important one really!! ), milk, flour, butter, salt&pepper, wholegrain mustard and a sprinkle of chilli flakes.... tasty! The added bonus is that you get a tasting of our homemade Banana chutney. Ben came up with the idea and its just great!! What a good idea for using up bananas that our great friends at Gandhis flipflop drop off after a festival! We returned home once to a MASSIVE box of bananas crying out to be made into something a little bit special!! And just as an added bonus, we're going to share the recipe with you! Banana Chutney - Rattle Gill Style! Simmer the Following for 1.5 hours with a lid on. Stir occasionally. Then add the following and simmer for approx 30 minutes uncovered. Do this until it thickens up. Stir occasionally. Then its just about bottling it all up, labelling and eating with everything!!! We've added a couple of newbies to our cake range recently....a blueberry and lemon sponge and a sticky ginger and lemon too! Both have been gobbled up pretty fast! Best get making some more I guess!! Thats it from us this week....apart from sharing this little stunner of a sunset photo....right from our scaffolding balcony! We are still encased in the stuff, but it will be off soon., and the paintwork will be better! Until then, we will carry on enjoying having our tea on the 'balcony'!! Welcome back magic little beans!!!! Please show your support and welcome back...The Rattle Gill Cafe smokey black beans...applause...cheering....whooping follows!!?? Some of you may have already tried the deliciousness that is the smokey black beans and some of you won't....never fear we have loads to go around! 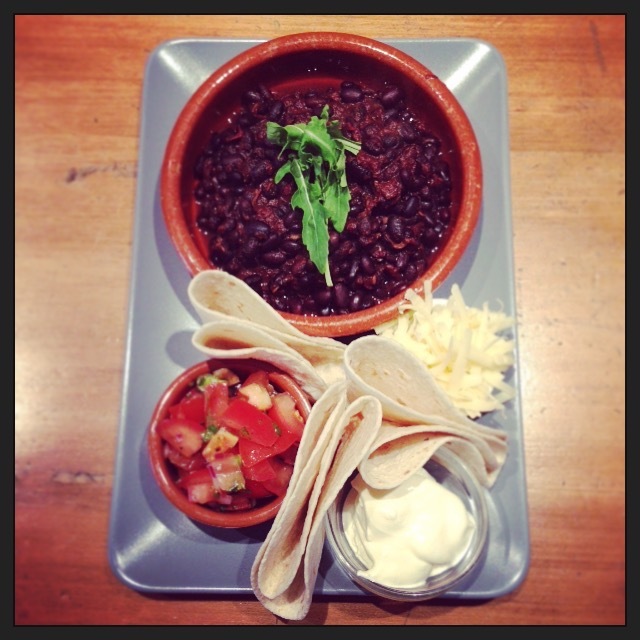 The beans come served with a tangy refreshing salsa, mature cheddar, creme fraiche and a pile of tortillas to make your own little wrap-ups. The beans are slow cooked in the oven with plenty of smoked paprika, cumin seeds, oregano, garlic, onions and tomatoes...touch of salt.They are one of those dishes that you could eat at any time of the day! We don't want to take full credit for these little beauties. A friend from Canada used to feed them to us, when we were working on her property helping to build a strawbale house. They would fill us up for a hard days work and keep us going! Packed full of protein and fibre and a great food for blood sugar regulation, they are a little super food really! they are even listed on www.whfoods.org as one of the healthiest foods around!! Go them! Other goings on include a mini facelift for the cafe frontage. The cafe is getting re painted...we asked for polka dots or stripes but I'm pretty sure they didn't like the idea and are going for white again. Stay tuned for the great unveiling in a week or so. The cafe will be taking on a rather industrial looking persona for the next couple of weeks, what with the scaffolding, but the inside will remain the same cosy, homely feel!! Alec got out for a little trot up Pike o Blisco to help Paul Tierney from Missing Link Fitness with the important job of marshalling the race. Well done to all those that took part...quite the slog up but look at that view...totally worth it! Rush hour in the lakes has a slightly different feel to it! Its just good to watch it all happen and take the time to enjoy the moment! Well, the summer holidays are in full swing, there are so many events going on its exhausting trying to fit it all in!! No one can say that it wasn't warm....we've had some great days over the past few weeks, Inbetween the brilliant thunder and lightening displays!! It might be raining now, but it's just filling up the plunge pools for more hot days to come! To welcome the summer we have got a really tasty Thai curry, that we're serving with crisp leafy greens and a refreshing noodle salad. The Thai curry paste is made from scratch, with tonnes of fresh ingredients;coriander, lemon grass, ginger, chillies, garlic and a touch of tamari. The smell when you whizz it all up is amazing, it would make a great base to a soup too. Then we have roasted some butternut squash and red peppers, stir fried some baby corn, mangetout and the paste, added it all together with stock and coconut milk and voilà!.....yummy curry done! I think even on a warm day, because of the coconut milk and other fragrant flavours it's just what's needed! We had our annual, all important job to do this weekend....judge the cake competition at the Langdale Gala...it's a tough job but we trained hard this year and felt ready for the challenge! There were some real treats to try...a lemony lemon drizzle, a light and fluffy Victoria sponge, a moist marmalade loaf, a velvet chocolate, a brioche style bread, carrot cake...scones...breads....and more....!! We took palate cleansing sparkling water and tea with us too! This weeks offerings come in the form of a Pasty! An unofficial Cornish, Cornish Pasty!! Although with the amount of Cornish family heritage I have, I think I should get to call our Rattle Gill Pasties, Cornish pasties!! Hopefully I've done my family proud with these little beauties?!! This week we have gone for a tasty filling of Stilton, Mushroom and Leek. They are gooood!!! A thick pastry crust, rammed full and a sprinkling of polenta to crisp up the outside. I'm going to have to lock them away from Alec and Ben, as they keep 'testing them', apparently doing some quality control tests!! The season for picnicking is very much upon us. We have found a special little place just up the hill that offers awesome views of Amble-City! We picnic with whatever we like and I've even taken to making homemade takeaway!! - tonight will be thai curry on the side of Wansfell! All you need is your favourite blanket, a glass of vino, clear skies and sunglasses! Go to it! So here is the Peanut Butter cake recipe for you to try! Butter 2 x 20cm round cake tins and line with baking paper. Heat oven to 175C. Beat the butter, 3 tbsp peanut butter, eggs, sugar and yogurt together until smooth. Fold in the flour, then split between the tins. Bake for 30 mins until golden. For the icing, combine all the ingredients and mix until smooth. This can then be kept in the fridge for cake assembly. Once the cakes are fully cooled you can ice them. Put one of the sponges onto a plate, spread with half of the icing. Sandwich the second sponge on top, then spread the rest of the icing. We also made a burnt sugar brittle for a little extra crunch! Only in June does the Rattle Gill get bathed in the morning Sunshine. Being that we are North facing, we enjoy a spot of time in the mornings with a brew enjoying the Sun on our faces...then of course its into work to make loads of scrummy goodies to feed everyone! Its official though..the summer is here!! !